Heaps of markets this August weekend means heaps of vegetables and fruits. Note the events at the Roppongi Market, a slightly different weekend for the Earth Day Market, and the UN University Night Market is this weekend, too. Plenty of opportunity to stock up on summer favorites as the season for many is coming to a close! This Saturday, August 20th will be Cooking for the First Time workshops for whipper snappers. Photo: Toziba's hand-woven dishcloths give even the dirtiest dish a good cleansing. 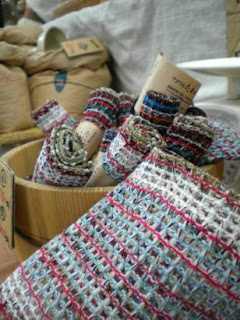 Check them out this weekend at the Earth Day Market!